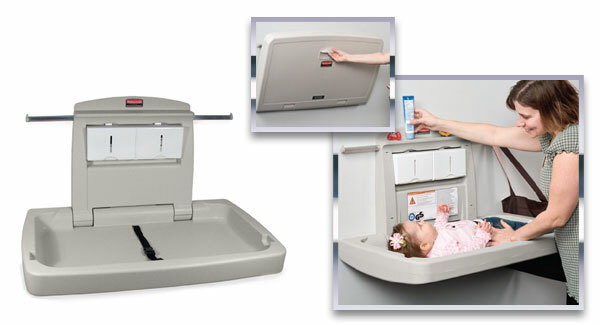 Provide best-in-class safety and antimicrobial protection with the Baby Changing Stations. The user-friendly, easy-to-clean ergonomic design meets all applicable global safety standards and regulations. Accessory Shelf – Shelf keeps baby changing supplies at hand, while keeping them safely out of the child’s reach. Station Liners – Built-in, easy-to-service dispenser holds up to 40 liquid barrier disposable liners. Safety – Meets all applicable ASTM, ADA, FDA, and EN global safety regulations and standards, improving user peace-of-mind. Cleanability – Cleaning and maintaining the Baby Changing Station is easy with its smooth, crevice-free design and large radius corners. Hygienic Protection – Manufactured with an antimicrobial agent that inhibits the growth of odor- and stain-causing bacteria and helps reduce the risk of cross-contamination.